An environmentally conscious model, the Lexmark C748e printer has an energy-efficient design and features a larger duty capacity than earlier models in the series. The Lexmark C748e produces maximum print resolutions up to 2400x600 dpi and it can print at fast rates up to 35 ppm. It offers many optional upgrades, including an optional hard disk, additional input capacity, and optional connectivity ports, including an optional wireless interface. These upgrades, however, come with extra cost. 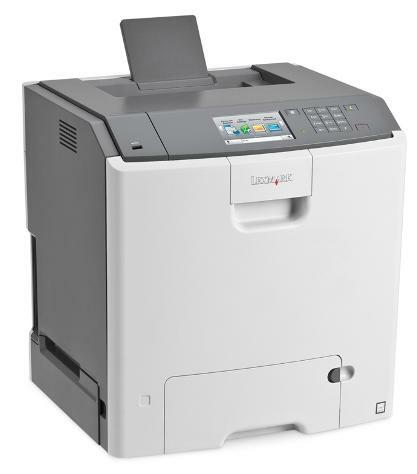 The Lexmark C748e laser printer has a typical colour-laser printer design. It measures some 17.9x17.1x15.7 inches and weighs only about 64 pounds. The C748e A4 colour laser printer has a colour LCD display that has touchscreen controls for easier selection of printer functions. The unit offers greater input capacity at 650 pages. The optional paper trays raise this number to 4,300 pages, while the output capacity is only up to 300 pages. The Lexmark C748e can be used over a network of users, thanks to its Ethernet interface. Speed and high input capacity are the main advantages of the Lexmark C748e. It can print at a fast rate of 35 ppm. The Lexmark C748e colour laser printer supports full colour printing and black and white printing and it prints on a wide selection of media up to A4 in size. The C748e Lexmark colour printer is built for use with different operating systems, not limited to Windows and Mac systems and it offers energy and eco-friendly features. Toner costs for the Lexmark C748e can be reduced over time by opting for high capacity Lexmark C748e toner replacement cartridges. However, users will have to spend extra when purchasing upgrades for the Lexmark C-748e printer. The unit does not offer multifunctionality and might be a bit too bulky for small offices.